Along the PCT, headed south from Harts Pass toward Grasshopper Pass. Location and directions: Okanogan County; from western Washington, drive SR 20 to Mazama. 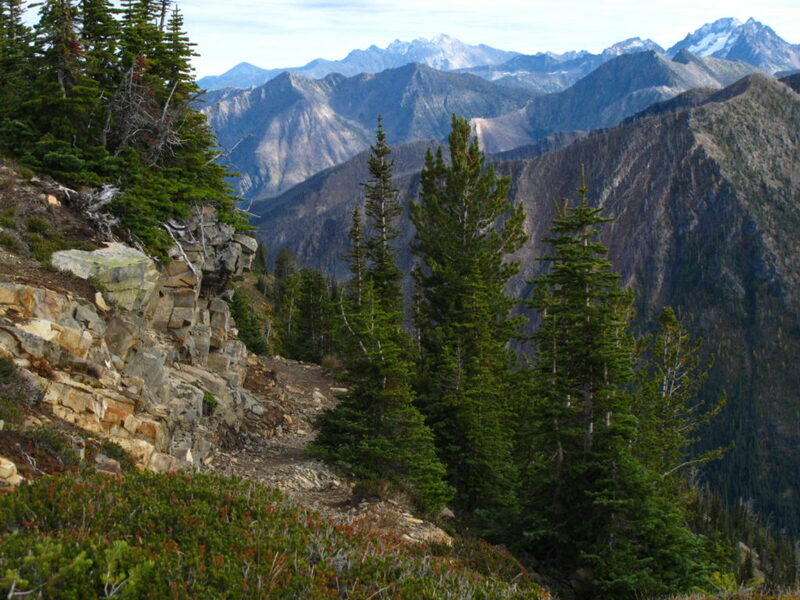 In Mazama, continue north out of town along Lost River Road, then take FR 5400 to the top. It’s signed well. The road is steep and narrow, with precipitous drop-offs, but not rough. Go slow and you’ll be fine. Length: Canada? Mexico? Once you’re on the PCT, the choice is yours. We did about 3-6 miles in either direction over multiple hikes this summer and fall. Sunbreaks and larches on the hike out from Grasshopper Pass. October, as my husband likes to remind me, is the most wonderful time of the year. This is especially true on the eastern slope of the Cascades. Ever since we discovered larches several years ago, quite by accident, we’ve made a pilgrimage to see them in their fall glory every year. Two kinds of larches grow in the inland Northwest, Western larches (Larix occidentalis) and alpine larches (Larix lyallii). They are members of the pine family and are related to the trees called “tamaracks” in the northeastern parts of the United States and Canada. Both are deciduous conifers whose golden fall foliage seems to create its own light, even on a dark day. 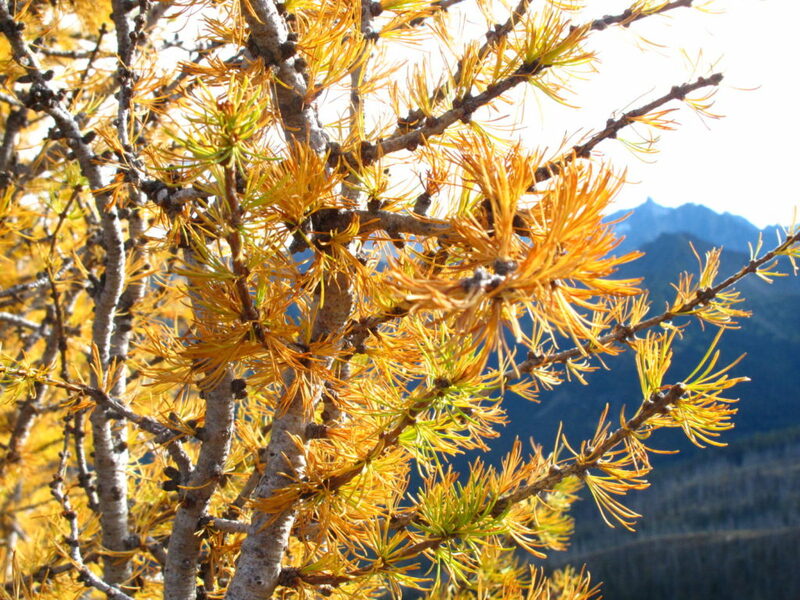 Western larch has a relatively limited geographic distribution in the Pacific Northwest, ranging south from around Bend, Oregon north to Kamloops, British Columbia and east of the Cascades to west-central Idaho (Northwest Trees). It is also abundant in parts of Montana and southeastern British Columbia. 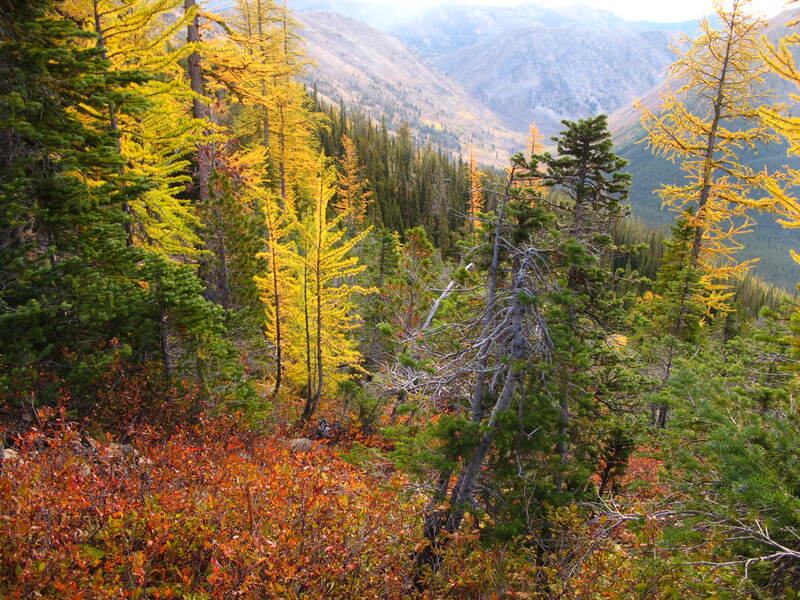 Because Western larches–like lodgepole pines, with which they often grow–are sun loving and fire tolerant, they tend to be the first to fill in after the forest fires that have historically shaped the region’s ecology. Alpine larches, on the other hand, like their terrain cold, rocky, and elevated. Sounds like a perfect place for camping! As you might imagine, it’s not always easy to get up close and personal with alpine larch. Previously, we’d either admired them from a distance or backpacked in over steep terrain in the areas south of Twisp, Washington. 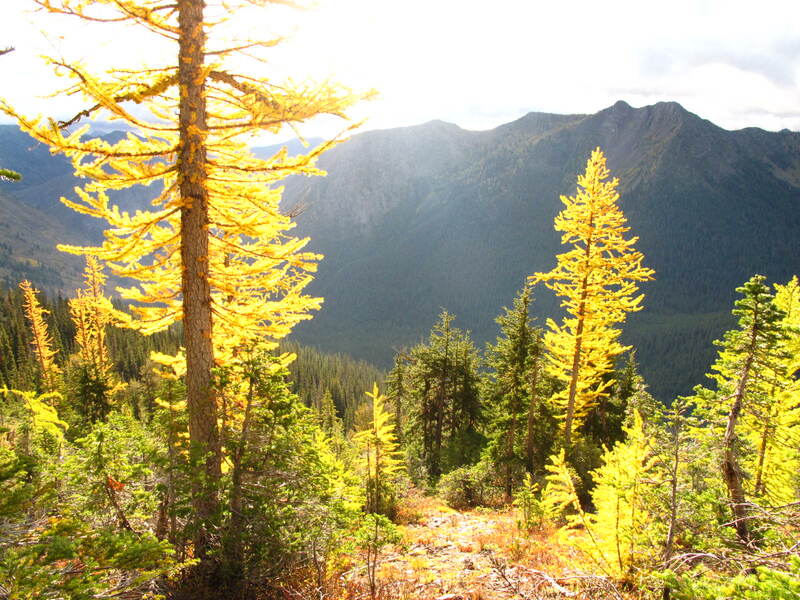 Although there are many fine trails to see larches in that area, a summer trip to Harts Pass showed us the golden-hued light. Harts Pass starts high and stays high; it’s the highest road in Washington State accessible by car. The trails from the top of the road access the Pacific Crest Trail: head south and you’ll go towards the Glacier Peak wilderness (and, you know, eventually to Mexico); head north and you’ll end up in Manning Provincial Park, in British Columbia, by way of the Pasayten wilderness. We backpacked both north and south in a series of short trips this summer and fall. Both directions are gorgeous and have inspired no small amount of wanderlust. During our summer trips, the area was relatively busy without feeling overly crowded. On this recent fall trip, the majority of hikers seemed to be through-hikers headed north on the PCT. If you head north, there are multiple campsite options on the way into the Pasayten (self-registration is required near the Slate Peak trailhead if you’re entering the wilderness area itself). This direction in particular would be a great introduction to backpacking for kiddos, as the grade is relatively gentle for the first few miles and the views are spectacular. There’s even a point where you can see Mt. Baker. If you head south, it’s about six miles to Grasshopper Pass (no water), where the trail switchbacks down and heads deeper into the Cascades. On this most recent trip, we camped near the pass. Although we pitched our tent in a protected stand of trees, the wind roared up the valley and reminded us that we were in fact in alpine larch territory. Despite a forecast of sun and mild temperatures, we awoke to clouds, drizzle, and more wind, a reminder that the conditions at 7000 feet are, well, variable. As we hiked out, the sun broke through the clouds just as we passed through a particularly lovely stand of larch. For about 10 minutes, we basked in their glow. They really do seem to light up the air around them, their foliage intensifying that crisp light so characteristic of eastern Washington. Then the clouds moved in again and we moved on, headed home, bidding a bittersweet farewell to the larches for another year.